Midea’s Fully Automatic Front Load Washing Machine takes on all the myths associated with front load washers and turns them on their heads — be it with a pocket-friendly price or water- and power-saving features. 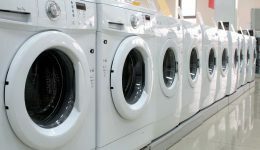 With 23 wash programs, handy Prewash and Extra Rinse functions, and an anti-bacterial gasket, there’s no denying there’s a new washing machine in town. Find out about the latest #FlipkartUnique deal and let all the myths burst like soapy bubbles!